Copyright 2011 by Elaine Fitzpatrick. Permission is granted to make and sell items from this pattern provided that credit is given to me as the designer. Permission is not granted to reproduce the actual pattern, or post it, or distribute it, without my express permission. Please respect my copyright and play nice! Photo is courtesy of Denise Dussault Leduc. Pdf file and chart are available here. *Row 12: (k1, p1) x2; k1; p27; k1; (p1, k1) x2. Row 13: (k1, p1) x2; k29; (p1, k1) x2. Row 14: (k1, p1) x2; k1; p27; k1; (p1, k1) x2. Row 15: (k1, p1) x2; k23; p4; k2; (p1, k1) x2. Row 16: (k1, p1) x2; k1; p27; k1; (p1, k1) x2. Row 17: (k1, p1) x2; k22; p4; k3; (p1, k1) x2. Row 18: (k1, p1) x2; k1; p27; k1; (p1, k1) x2. Row 19: (k1, p1) x2; k22; p3; k4; (p1, k1) x2. Row 20: (k1, p1) x2; k1; p6; k1; p20; k1; (p1, k1) x2. Row 21: (k1, p1) x2; k1; p5; k14; p1; k8; (p1, k1) x2. Row 22: (k1, p1) x2; k1; p8; k1; p10; k3; p5; k1; (p1, k1) x2. Row 23: (k1, p1) x2; k9; p10; k10; (p1, k1) x2. Row 24: (k1, p1) x2; k1; p8; k1; p7; k1; p10; k1; (p1, k1) x2. Row 25: (k1, p1) x2; k10; p1; k9; p1; k8; (p1, k1) x2. Row 26: (k1, p1) x2; k1; p7; k1; p10; k1; p8; k1; (p1, k1) x2. Row 27: (k1, p1) x2; k6; p4; k11; p1; k7; (p1, k1) x2. Row 28: (k1, p1) x2; k1; p6; k1; p10; k1; p4; k2; p3; k1; (p1, k1) x2. Row 29: (k1, p1) x2; k3; p1; k7; p1; k10; p1; k6; (p1, k1) x2. Row 30: (k1, p1) x2; k1; p15; k1; p3; k3; p3; k1; (p1, k1) x3. Row 31: (k1, p1) x2; k3; p1; k1; p1; k3; p1; k2; p1; k9; p1; k6; (p1, k1) x2. Row 32: (k1, p1) x2; k1; p14; k1; p2; k1; p5; k1; p3; k1; (p1, k1) x2. Row 33: (k1, p1) x2; k5; p1; k5; p3; k8; p1; k6; (p1, k1) x2. Row 34: (k1, p1) x2; k1; p14; k1; p6; k1; p5; k1; (p1, k1) x2. Row 35: (k1, p1) x2; k5; p1; k1; p1; k6; p1; k7; p1; k6; (p1, k1) x2. Row 36: (k1, p1) x2; k1; p8; k4; p1; k1; p5; (k1, p3) x2; k1; (p1, k1) x2. Row 37: (k1, p1) x2; k3; (p1, k5) x2; p1; k4; p1; k1; p1; k6; (p1, k1) x2. Row 38: (k1, p1) x2; k1; (p6, k1) x2; p3; k1; p9; k1; (p1, k1) x2. Row 39: (k1, p1) x2; k3; p1; k5; p1; k1; p3; k15; (p1, k1) x2. Row 40: (k1, p1) x2; k1; p6; k1; p16; k1; p3; k1; (p1, k1) x2. Row 41: (k1, p1) x2; k5; (p1, k3) x2; p1; k8; p2; k5; (p1, k1) x2. Row 42: (k1, p1) x2; k1; p3; k1; p15; k1; p1; k1; p5; k1; (p1, k1) x2. Row 43: (k1, p1) x2; k7; p2; (k4, p1) x2; k3; p2; k5; (p1, k1) x2. Row 44: (k1, p1) x2; k1; p6; k1; p12; k1; p7; k1; (p1, k1) x2. Row 45: (k1, p1) x2; k13; p1; k15; (p1, k1) x2. Row 46: (k1, p1) x2; k1; (p6, k1) x2; p13; k1; (p1, k1) x2. Row 47: (k1, p1) x2; k15; p1; k4; p1; k8; (p1, k1) x2. Row 48: (k1, p1) x2; k1; p8; k4; p15; k1; (p1, k1) x2. I just found your blog through Ravelry. :) I LOVE your bibs! And thanks for the great instructions! 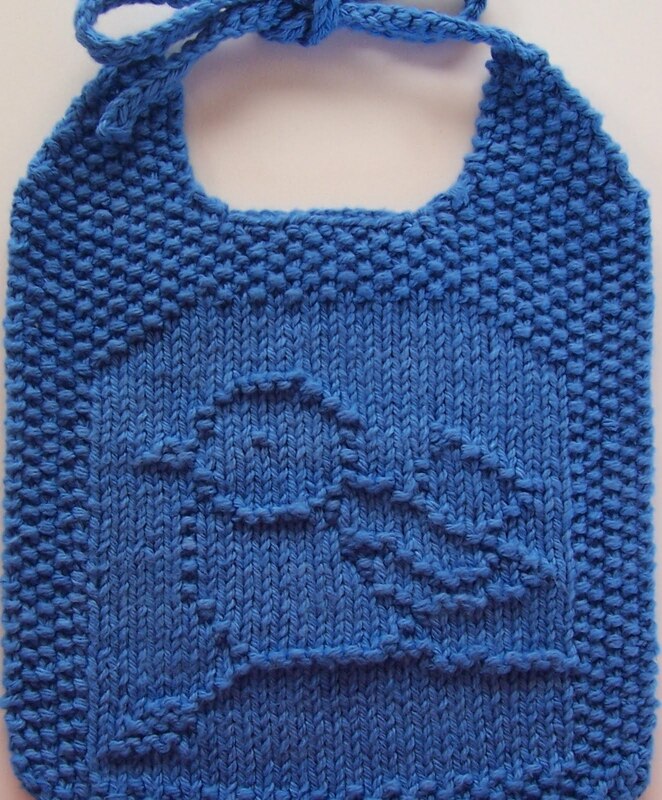 I am in the process of knitting some of your bibs to give to a niece who is expecting her first baby. I just tried on with the "short rows" and I LOVE it!!! That is so much easier and leaves a cleaner edge than casting on at the start of rows!! Thanks!!! !